AGROFINAL, spol. s r.o. in Hlohovec (a city 60 km east of Bratislava) has been producing the Mistral pneumatic seeding system for 20 years. On the basis of this system, pneumatic seeding equipment is constructed that can be used for sowing all kinds of seeds with a grain size from 1 to 10 mm. For this reason it is possible to use this seeding equipment for not only dense grains but also legumes and oil seeds (peas, beans, soy, rapeseed, etc.). 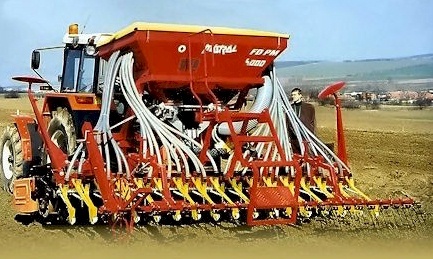 The MISTRAL pneumatic seeding system is able to spread all categories of seeds over various working lengths (from 2.5 to 8 m) and can be fully customized by adding additional equipment including all types of tools for soil preparation (passive cultivators or rotating harrows) types of points, seeding capacity, electronic equipment, accessories, etc. The basic components of MISTRAL seeding equipment have been successfully implemented in equipment that reduce the amount of pre-seeding soil preparation including non-ploughing techniques. The use of pneumatic seeding equipment enables increased harvest yields and also reduces seed consumption. Our company is the supplier of pneumatic seeding equipment for a variety of firms. 70% of our production is exported to the European Union, mainly to Germany, Spain and Italy as well as to Russia. We participate with our partners at some of the most important international agricultural exhibitions, for example: Agritechnika Hannover, EIMA Bologna, SIMA Paris and others.